Before this complete transformation, this large master bathroom built in the 90’s was virtually unusable with large amounts of space wasted for a fireplace, a raised floor and a large floor level soaking tub. This left the shower and toilet squished together in a small closet sized room. Materials used were a 24×24 porcelain, maple cabinetry, gold plumbing & light fixtures and a dated faux finish on the walls. As you can see, this bathroom doesn’t even look like it’s in the same space. The fireplace, the raised floor and floor level soaking tub were completely demolished. 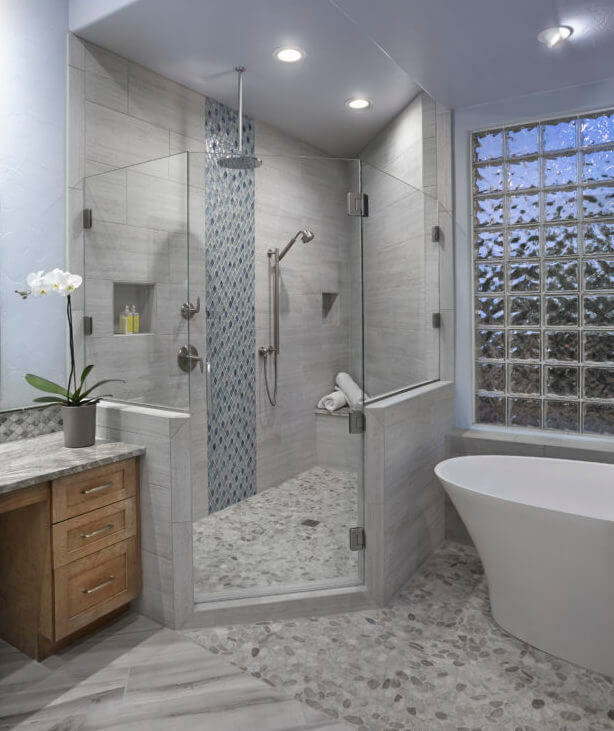 In its place, is a large updated shower with room still for a freestanding tub. 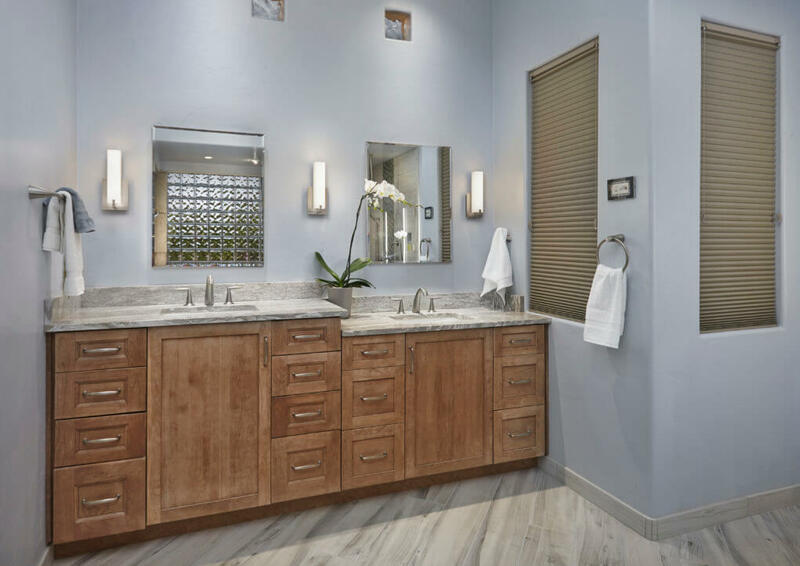 There is now a long 2 sink vanity as well as a makeup vanity updated with quartz countertops, clean contemporary cabinetry and a sparkling backsplash that is repeated in the shower. The flooring provides great organic textures by using wood plank porcelain in the vanity areas and pebbles in the shower and tub area. The toilet is now confined to its own private space that once held both the shower and toilet. All hardware was changed out to timeless satin nickel finish. The overall colors selected are cool neutrals to help play up the luxury spa feeling of the space. What a difference! As with these clients, when there is a dramatic height disparity, it becomes necessary for the vanities to feature a differing heights.